React has gained a lot of popularity recently and has attracted a large and active community. This results in a vast wealth of reusable components for it that will save you time when coding. The library itself encourages writing loosely coupled code that is modular and composable. In this tutorial, I will show you how to create a small application and how to split it into discrete components that talk to each other. As a base, we will take the npm-driven website example from last month, but we'll do it the React way. It is interesting to compare the results - the React version has a few more lines of code than the jQuery version, but we can both agree that it is much better organized. It is a popular client-side library/framework for building user interfaces, which is developed and used by Facebook. With it, you organize your application around discrete components, with each handling its own rendering and state. Components can be nested within each other. React is fast because it minimizes the number of writes to the DOM (the slowest part of any client-side application). It hasn't hit version 1.0 as of this writing, so there might be changes in the future. We have a nice article with examples for learning react which you can check out. Also there is the official getting started guide here. 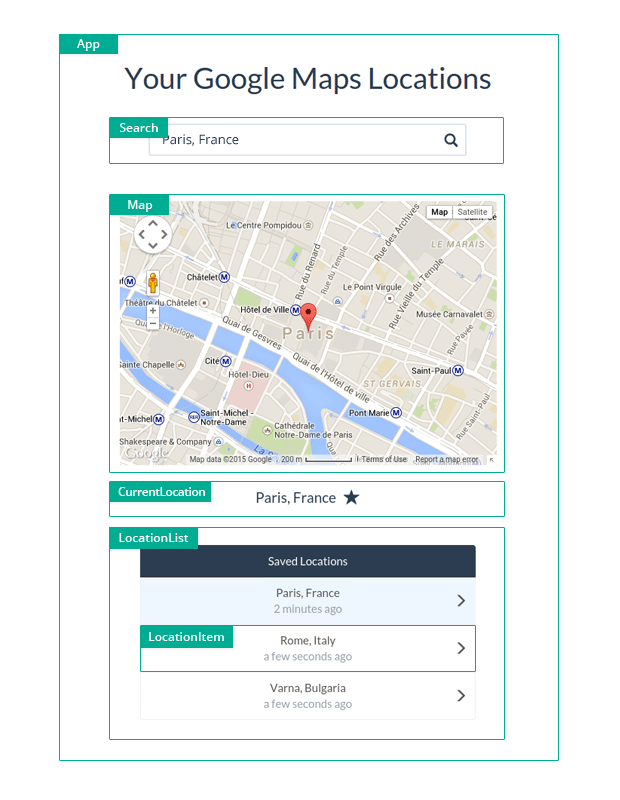 We will create a simple web app, which invites people to search for locations and to store them in their browsers' localStorage. The locations will be presented on a Google Map with the help of the GMaps plugin. We will use Bootstrap with the Flatly theme for the interface. In the process, we will break the application down into logical components and make them talk to each other. Download the zip with the source code from the button above. Extract it to a folder somewhere on your computer. Open a new terminal (command prompt), and navigate to that folder. Execute npm install. This will download and install all dependencies that are needed. Open index.html in your browser. You should see the app. The source code is easy to follow and has plenty of comments, so for those of you who prefer to read the source, you can skip the rest of the article. Reactify supports a limited set of the new ES6 features with the --es6 flag, which I've used in the source code (you will see it in a moment). Watchify will monitor your files for changes and recompile your source code if it is needed. It also enables source maps, so you can use the Chrome Debugger to step through your code. Great! You can now write React modules, require() npm libraries and even use some ES6 features. You are ready for writing some code! App is the main component. It contains methods for the actions that can be performed by the user like searching, adding a location to favorites and more. The other components are nested inside it. CurrentLocation presents the currently visited address in the map. Addresses can be added or removed from favorites by clicking the star icon. LocationList renders all favorite locations. It creates a LocationItem for each. LocationItem is an individual location. When it is clicked, its corresponding address is searched for and highlighted in the map. Map integrates with the GMaps library, and renders a map from Google Maps. Search is a component that wraps around the search form. When it is submitted, a search for the location is triggered. First up is App. In addition to the lifecycle methods that React requires, it has a few additional ones that reflect the main actions that can be performed by the user like adding and removing an address from favorites and searching. Notice that I am using the shorter ES6 syntax for defining functions in objects. In the render method, we initialize the other components. Each component receives only the data that it needs to get its job done, as attributes. In some places, we also pass methods which the child components will call, which is a good way for components to communicate while keeping them isolated from one another. Next is CurrentLocation. This component presents the address of the currently displayed location in an H4 tag, and a clickable star icon. When the icon is clicked, the App's toggleFavorite method is called. LocationList takes the array with favorite locations that was passed to it, creates a LocationItem object for each and presents it in a Bootstrap list group. // LocationList to each LocationItem. LocationItem represents an individual favorite location. It uses the moment library to calculate the relative time since the location was added as a favorite. Map is a special component. It wraps the Gmaps plugin, which is not a React component by itself. By hooking to the Map's componentDidUpdate method, we can initialize a real map inside the #map div whenever the displayed location is changed. // the page. This is why we are calling the following method manually. // This makes sure that our map initialization code is run the first time. // The map has already been initialized at this address. // (and cause it to flicker). The Search component consists of a Bootstrap form with an input group. When the form is submitted the App's searchForAddress method is called. <input type="text" className="form-control" id="address" placeholder="Find a location..."
All that is left is to add the App component to the page. I am adding it to a container div with the #main id (you can see this element in index.html in the downloadable zip file). I hope that this tutorial gave you a better understanding of how to structure React applications. There is much more you can do with the library, including server-side rendering, which we hope to cover in the future. It's an amazing web app!! Can you add auto-complete or suggest location while typing in location text field?? I have created a simple repo which has react integrated with server and i am using browserify for porting react code to client as well. Would love if people can contribute and make it better. This is awesome! Please keep this up! React.js is a really interesting library, and I'd love to see more of it on this site. Thanks again! That's amazing app. I can learn a lot of from your article. Thanks Nick very much. It seems odd to me, as I'm learning this. Why do you define all your functions in the "app" level and pass them around from function to function? Shouldn't you let the component handle it's functionality? It seems strange and inefficient to define one giant list of functions and pass them around. When running NODE_ENV=production browserify -t [ reactify --es6 ] main.js | uglifyjs > compiled.min.js I get an error that it cannot find module 'moment' in the components directory. Bummer, I was looking forward to this. Also users need to globally install browserify and uglify-js, you might want to make sure people know that before doing the tutorial. Can't assume people have the exact preset dev environment as you. Awesome tutorial, bud! Laid it all out clean and concise. Since update of react to 0.14 version, it has been separted to react and react-dom. Maybe you should also update your tutorial and change the souce codes as well. Other than that, great tutorial. I created an updated version of this tutorial (https://github.com/MorganLKestner/react-location-search-app) that complies with the new version. It's a mistake, thanks for spotting that out.